With Christmas finished for another year, many of us are beginning to turn our attention to the year ahead. For some of our too cool for school long term adult cats, they are looking for their forever home to ring in the New Year. Could you be the perfect match they are looking for? 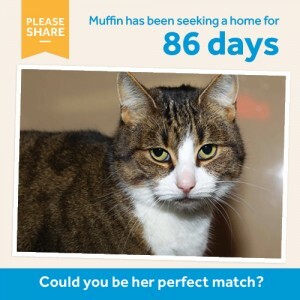 Muffin is a beautiful cat with a sweet, loving nature. With her easy going temperament it is hard to believe that she has been available for adoption for 86 days. Sadly, five year-old Muffin’s time before arriving at the Home’s North Melbourne shelter wasn’t easy. Arriving with a significant burn to her back, Muffin needed treatment from the Home’s shelter medicine department and time out with a foster carer to allow enough time for her injury to heal. Now fully recovered, Muffin is looking for a quiet home with an owner who is happy to give out chin rubs and allow this connoisseur of comfort explore her surroundings. In return you’ll get a loving, loyal and gentle companion whose personality will shine through. You can watch Muffin in the fur in the video below or you can read more about her journey here. An attention seeker through and through, Neko is a sweet cat with more than enough love to share with those around her. 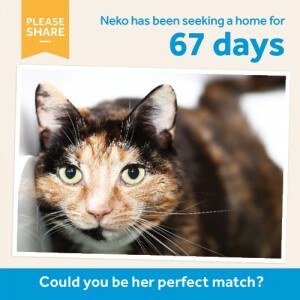 Despite her affectionate nature, four year-old Neko has been looking for her perfect partner for 67 days. Neko loves company and often enjoys being cuddled by those around her – especially if pats and chin rubs are on offer as well. A real people cat, this friendly feline will quickly win over those around her with her loud purr and darling nature. Billie Barnacle is a shy cat who can be a little reserved when meeting people for the first time. However, once she gets to know you, she is a friendly and affectionate cat who loves being around her nearest and dearest. 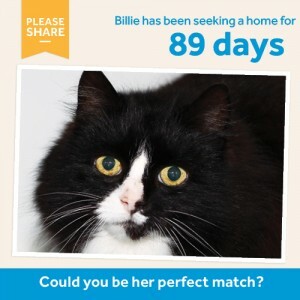 Looking for her ideal home for 89 days, this four year-old gentle cat will suit a quite home with an owner who understands she will be shy until she finds her paws and makes friends. Billie Barnacle loves being patted and relishes in being scratched behind the ears. With some time and patience, Billie will thrive in her new home with a loving family. Adopt until January 3 and for a cool $47.50 for cats and $85 for kittens under six months, you could have a new addition to your family these holidays. All of these fabulous felines come fully health checked, desexed, microchipped, vaccinated and wormed – all coming in excess of $300 per cat! To receive the discount, you’ll need to complete our Pet Licence test at our shelter or online. Adopt: Visit our North Melbourne or Campaspe shelters to meet all of our adoption candidates in the fur – our staff are keen to find you your perfect match! Foster: We’re always on the lookout for foster carers to help care for cats and kittens at the Home. With foster periods averaging from two to four weeks, this is a terrific way to give a cat some much needed time out in a home environment, while creating essential space at our shelters. Advocate: See a cool cat looking for a new home, but can’t adopt? Why not share their profile via your Facebook page, email or good ol’ word of mouth!